For the past two weeks, I have been an Outlander junkie. I picked up Diana Gabaldon’s first novel while I was in Bookworks, waiting for Jen Sincero to arrive and begin her book signing. I’d had a recent encounter with a woman with brain damage who had professed her abiding love of Gabaldon’s work, and I knew the time had come to pick up Outlander. The opening lines of the novel hit me the same way a car fan recognizes the roar of a Lamborghini — exquisite, perfect, and full of destiny. The sound of great power. That’s what I heard in Gabaldon’s prose: a masterwork of engineering. A gifted writer. My fingers buzzed. My head buzzed. I felt breathless and faint, even though I was kneeling on the floor and not in danger of falling over. I put the book down after only a minute, walked around the store with a sappy grin, somehow managed not to stumble into anything, since I couldn’t see anything in front of me but the words I’d just been reading, then I returned to the science fiction section and picked up the book again. I read as much as I could in ten minutes, which felt the same way I imagine drinking shots feels, slamming down an elixir that hits your body with a painful euphoria, the primary difference being that alcohol is a poison to the body, and words are only poisonous if we allow them to be. In this case, Gabaldon’s words were far from toxic, so I should probably return to my first analogy: opening her book was like taking a seat behind the wheel of the high-end Lamborghini she’d built, and starting the ride. I didn’t buy the book right then for two reasons: 1. I had already purchased a book at the store (a copy of Jen’s You Are a Badass, of course), and 2. I knew I could buy Outlander at a small store in Durango, White Rabbit Books, which I pass by almost every day when I walk the river. I shop local whenever I can. So Greg drove us home the next morning, right to the door of White Rabbit Books, and I met Keena, the owner, and purchased a copy of Outlander. and I’m not someone who keeps much on my desk. A lamp, a cup warmer, a jar of pens, and a calendar on a clipboard. Those items, plus my desktop machine, are all I can tolerate having around me. I need emptiness to get work done. Open surfaces, and absolutely no loose papers. But Outlander has been my constant companion for the past two weeks. It’s over 350,000 words long, and I’ve read it twice now. Certain sections, I’ve reread as many as ten times, maybe more. And I will definitely read the entire novel again. Just picking it up, and touching the paper, and smelling the glue in the binding gives me such an intense high, I could fall out of my chair and lay on the floor with feverish glee. I’ve always loved books with insane abandon, and the love I have for Outlander is a savage delirium, the kind of love that drove Romeo and Juliet to kill themselves in a fit of despair. Love hurts as much as it fills us with joy, and that is how I love Outlander — so much that it hurts, so much that it’s like dying and then being reborn, every second, when I hold the book in my hands. And then there is the TV show, which debuted on August 9 this year. The TV show is so badass, it’s like having another gorgeous Lamborghini parked in my driveway, which I can take out and drive anytime. Each book of Outlander (and yes, it’s already been picked up for a second season) will be given 16 episodes, which is amazing when you consider the fact that Game of Thrones is only given ten episodes for each book. The first eight episodes of Outlander have already aired, and I watched them all this weekend with Greg. We have Starz in our cable package, and the Outlander episodes are available through the Starz On Demand channel, which is channel 240 on our box. It took me five days of agony to figure this out, as I originally just tried searching through all the Starz channels to find the times Outlander aired. I so, so rarely watch TV (outside PBS) that I didn’t realize my life could be so infinitely awesome with Starz On Demand. I can now watch Outlander episodes anytime I want, because they’re free with my Starz subscription. The second eight episodes of Outlander will debut starting April 4 of next year, which means a delirious wait to see the rest of the first novel brought to the screen. Don’t get me wrong — no matter how beautiful the TV show is, it will never — EVER — be as orgasmically brilliant as the book. But the show is still really brilliant, gorgeous in its own right, and I love it. I love it in a very different way than I love the novel, and not nearly as intensely as I love the book, but it is still a powerful love, even if it is exponentially different than the feverish glee the book gives me. 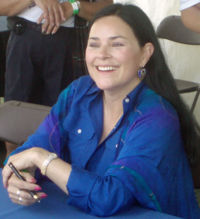 And then there are the videos on the Diana Gabaldon YouTube Channel, which soothe my nerves, because I love to listen to Diana Gabaldon speak. Her voice and demeanor are so calming and inspiring, I could listen to her interviews all day. She is 62 years old — and this picture was taken seven years ago (in 2007), but she doesn’t look any different — and I can say this with authority, as I’ve watched several of her videos from the past two months. But I have the second book on order with White Rabbit Books, and I’ll be reading them all. The eighth book in the series, Written in My Own Heart’s Blood, came out this summer, and Diana has been on a book tour for the eighth book as much as she’s been helping promote the TV show. Also, Outlander is not for everyone. I was reluctant to read the novel because I’ve seen enough terrible reviews on Goodreads that I avoided the book for a long time. Fans of the book would quietly defend their love for Outlander in the comment threads of those scathing reviews, and encourage people not to write the book off based on someone else’s opinion. One young woman in particular stands out in my mind, saying Jamie and Claire have one of the greatest love stories of all time, and now, months later, having read the book, I can say I agree with her. Outlander knocked me over. 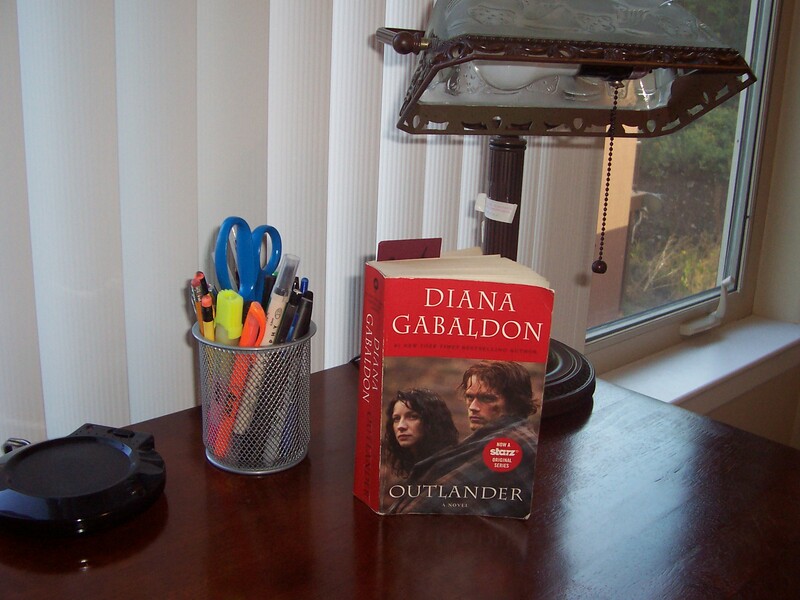 I’m going to have to add a second list of My Favorite Books soon, a new list of 20 favorite reads on my webpage, and Outlander will be at the top.